ISR integrates swimming skills that are developmentally appropriate for young children, teaching them to save their own lives, while building the confidence that can lead to a lifetime of fun in and around the water. For 45 years, ISR has successfully provided over 7 million safe lessons to infants and young children. ISR is excited to announce that the ISR Self-Rescue™ program is expanding to Greenfield, Wisconsin. We look forward to welcoming new Instructors into the ISR family, as we work together towards the day that "Not One More Child Drowns." The ISR lesson experience is a comprehensive six-week program where each lesson is customized for the child as they are safely guided through the learning process. Lessons will be held between 3:00pm - 6:00pm year round! 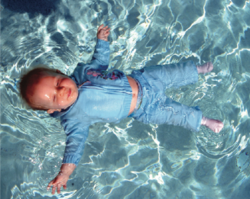 Founded in 1966, Infant Swimming Resource (ISR), with its Self-Rescue™ program, is nationally recognized as the safest provider of survival swimming lessons for infants and young children. With a primary focus on safety and effectiveness, and as the world’s leading behavioral science based instruction program, ISR is the only choice for parents who are dedicated to their child’s safety, education and developmental needs. ISR’s worldwide network of highly qualified, certified Instructors has successfully delivered over 7 million safe lessons to infants and young children, which have resulted in our record of nearly 800 documented cases of children utilizing ISR’s survival techniques to save their own lives. For more information on ISR, water and swim safety or to find an Instructor in your area, please visit http://www.infantswim.com.